The KTM RC390 is getting updated for 2019. The new RC390 will get fresh design changes and will now be more up-to-date like the current Duke 390 and it will also be bigger and more powerful. We have just found new spy shots of the incoming RC390. 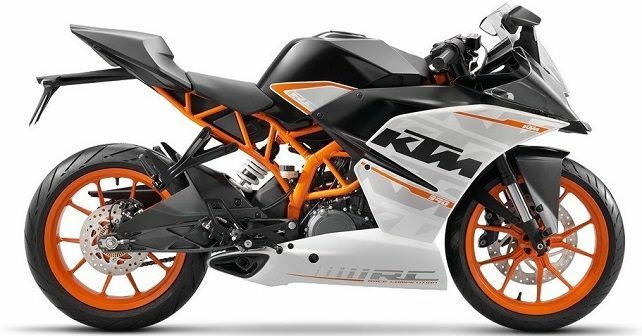 The mini supersport otorcycle from Austrian bike maker KTM, was last updated a year ago, but it still is hugely outdated when you compare it to the new compeition such as tthe Kasawaki 400 and the new Yamaha R3. While, the Duke 390 does have more features and better technology the RC390 is still stuck in the past. However, the new spy shots suggest that the 2019 model of the KTM RC390 will be bigger, more powerful, and come with some great features. First off, the new design has gotten some changes, and the body work looks tweaked and so does the windshield, which looks bigger. The fuel tank also looks to be a little bit bigger and the trllis frame has also been modified. This however, is a prototype model, but it looks like KTM is trying to make the bike more accessible to taller riders, where the current version feels a little cramped. There will also be some tech updates, and it looks like the RC390 will get the same features as the current Duke 390, which includes the full colour TFT screen and istrumentation. It will also get a LED headlight. We also beleive that the new RC390 will get better suspension as well in the the form of a setup from WP. ON top of that it will also most likely receive new brakes and a more powerful motor. Other signiificant changes will make it Euro5 friendly and it will also get the same gearbox from the Duke390, which is more refined. You can expect the updated RC390 to hit Indian roads some time towards the middle of 2019.